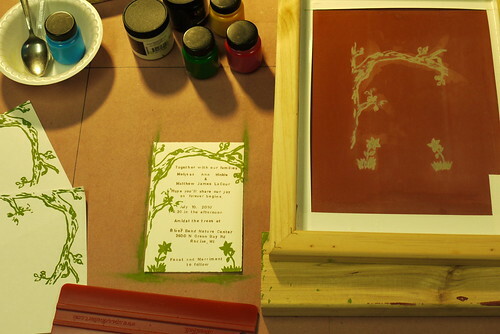 screen printing design, originally uploaded by ordinarymoment. After all the text was printed, it was on to the final graphic. I sketched, erased, and sketched some more until I came up with a design that had the earthy, organic feel we were going for. I used drawing fluid to block out the screen which ended up giving it a more painterly look. A little less detailed from the photo emulsion technique I was used to, but much quicker and less equipment! After the drawing fluid dried, I had to use filler to block out the rest of the screen. After THAT dried and the drawing fluid was rinsed out, it was on to the super fun swishing step that makes screen printing so awesome. I used all those colors of ink to create the perfect shade of green, then set up each invite in a grid to be sure the image was printed in the right spot. This last part was much more enjoyable than all that text business, and oh so satisfying to see the finished product!